1/3 cup Pistachios, chopped An additional handful can be used for garnish. Bring chicken stock to a boil in a sauce pot. Meanwhile, in a separate medium sized bowl, combine chicken thighs, cinnamon, ground cloves, oil, and salt and pepper to taste. Heat a separate skillet on medium-high heat. Sear chicken thighs for 3 minutes on each side, a total of 6 minutes. Chicken will be partially, not fully cooked. Remove chicken from skillet and place aside. Add onions to skillet and sauté for 3-5 minutes or until translucent. 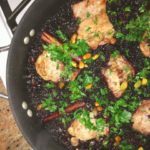 Add uncooked rice, chopped pistachios, and currants to skillet and mix with onions. Place cinnamon sticks on top of rice, one in each corner of the skillet. Pour boiling chicken stock over rice. Then place chicken thighs on top of cooking rice. Cover and reduce heat to medium-low for 35-40 minutes. (There should be a slight simmer in the skillet while cooking.) Do not mix rice or remove cover while cooking. Remove cover. Chicken stock liquid should be completely or mostly absorbed by rice. Chicken is done cooking when it reaches 165 degrees F on a meat thermometer. Add parsley and dill and fluff rice with fork. Add handful of pistachios on top of dish. Serve with a side of a green veggie and enjoy! Chicken breasts can also be used in place of thighs for a leaner dish.